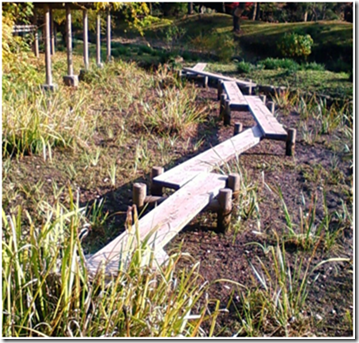 Black Walnut Table "Yatsuhashi (Zigzag Bridge)"
池にかかる八橋　Zigzag bridge in the pond on garden. This table consists of two large planks of walnut that have been book-matched, that is to say. As its form and the shape of its legs resemble a traditional type of Japanese bridge, I named the work ‘Yatsuhashi’ (Zigzag Bridge). One of the boards has been given a smooth finish while the other retains the lateral marks of a plane and is slightly lower, expressing welcome towards a guest. Furthermore, the way in which the planks have been juxtaposed to avoid being parallel allows people sitting opposite each other to avoid meeting each other’s eyes. 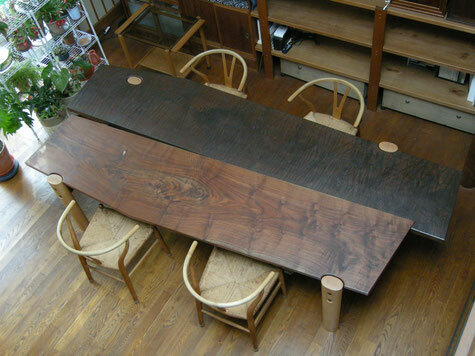 Made from Figured Japanese maple the table legs are a complete contrast to the top in both color and texture. 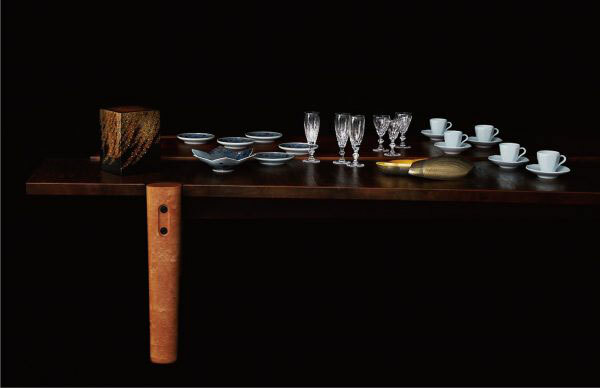 The whole table is quite large and has been designed to make it possible to be disassembled, the legs being held in place with black Allen bolts that form a feature of the design. The legs extend above the tabletop, thus creating the image of the zigzag bridge for which it is named.